Did you know more pets go missing over the July 4th holiday than at any other time of year? Historically, July 5th is the busiest day at Animal Shelters in the U.S.A. This year is going to be especially challenging for pet guardians because the holiday lands in the middle of the week. No doubt people will be setting off firecrackers from Saturday, June 30 through Sunday, July 8th. Celebrating the 4th of July with its loud pyrotechnics and fireworks displays may be fun for humans, but it scares and disorient pets in a matter of seconds, causing them to melt down in terror with many trying to flee from the safety of their homes and go missing. Why? Animals become anxious and scared when they hear loud noises and see bright flashing lights. Their instincts tell them to run as fast and far away as possible to escape the source of their discomfort and anxiety. Throughout the Independence Day weekend, your pets will hear noises you might not be aware of because of their sensitive ears and nervous systems. Once an animal becomes frantic, it's difficult for them to calm down. It's better for your pets, and you to prevent your pets from becoming distressed in the first place. Once in the "red zone," your pet can no longer hear you. Instead, their panic drives them to find a safe place away from the perceived danger. This is why animals tend to hide under furniture, go into a closet, or try to escape their backyards and homes by whatever means possible. This video from PETA shows, from a dog's perspective, how quickly a dog can become spooked and fast they can run from fireworks and firecrackers with potentially life-threatening consequences. Recognizing the physical signs of stress is the first step to alleviating your pet's distress. It's essential you communicate with your pets before the holiday begins to help them cope and deal with the fireworks. Kobe Bear hated fireworks and loud noises. 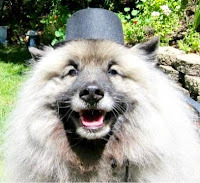 My second Keeshond, Kobe Bear, now In Spirit, became extremely anxious during the 4th of July celebrations. It didn't help fireworks could be seen and heard from every room in my house for approximately 30 long minutes, two nights in a row. The first year I had Kobe Bear, I had no idea how upset he would get from fireworks since my previous dog had no problems with loud noises or pyrotechnics. Kobe Bear, on the other hand, melted down with intense fear and became inconsolable. Despite being able to communicate telepathically to Kobe he was safe, his fear overwhelmed him to point where he couldn't hear me. Over the years, I came to dread the 4th of July fireworks displays because it was awful watching my dog suffer. One year, Kobe was so freaked out, he tried to jump out of a 2nd story window when the fireworks display began as he attempted to escape the scary noises and lights that he didn't understand. Despite closing the windows and blinds, keeping him in a back bedroom, feeding him delicious treats and playing music, Kobe could still feel the vibrations the fireworks created. Unfortunately, Kobe Bear's terror didn't end when the firework displays ended because people in my neighborhood continued to set off firecrackers throughout the holiday. He trembled and barked every time he heard a loud noise. Despite my best attempts to calm and communicate with him, Kobe suffered terribly. In hindsight, I should have considered medicating him to alleviate his suffering. Tip #1: Your pet's ID is their ticket home. If you do nothing else, put a collar with current ID tags securely on your pet at the start of the holiday weekend. ID Tags are the quickest and easiest way for your pet to be returned to you if they go missing. Make sure your information on the ID Tags is current and remember to include your cell number. If you have a horse, you may want to place a safety or breakaway halter on them with your current contact information. This way, your horse is wearing her ticket home just in case she spooks and runs away. Use ID tags in addition to microchipping your pet. It's important to microchip your pet especially if they end up in an Animal Shelter. If your pet isn't microchipped already, talk to your veterinarian about getting your pet microchipped. It's a good time to double check that your microchip information is up-to-date. Remember, your pet's ID Tags are their ticket home if they go missing. Tip #2: Never use fireworks around your dog or other pets. The noise will spook them with an excellent chance they may run away and go missing. Fireworks can quickly burn the fur on an animal, so it's best to keep them away from this type of hazard. Tip #3: Exercise reduces your pet's stress. On high-stress days, like the 4th of July, it's an excellent idea to give your animals their exercise early in the day, so that they can be tired when their world starts to explode. A tired animal tends to cope and deal with the loud noises better than a pet who has too much energy. Also, take your dog out for a long walk and potty right before the start of the fireworks displays, which will help them sleep. Taking your pets out during the fireworks display or later, when random firecrackers are set off, will significantly increase the chances of your pet going missing. Tip #4: Leave your pets safely secured inside your home. Put your pets in a quiet "safe room" or crate where they can't accidentally escape. Having a "safe room" will help reduce their stress. Cats are amazing escape artists. Put cats, including outdoor cats, in their "safe room" with their litter box and fresh water. Make sure they are wearing a collar and ID. You may want to consider using a GPS collar if you're concerned about your pet escaping. Your pets will be happier and safer if they stay home. You may think it's fun to bring your dog to fairs, holiday celebrations, and fireworks shows, but I promise you, it's no fun for your dog. In fact, it can be a scary experience. If it's hot, your risk burning your dog's paws or experiencing heat stroke. Tip #5: Stay home with your animal friends. It's important you remain home to be a calming influence for your pets especially if they feel like their world is crashing down around them. Many animals tell me they cope better when their person is with them. Otherwise, they say, it's overwhelming to deal with loud, thunderous noises that might swallow them up or even worse, hurt them, without their person to protect them. Tip #6: Decrease visual stimulation. Bright, flashing lights can upset animals, sometimes to the point where they will jump out of a 2nd story window. Keep blinds and curtains shut and close the windows. If need be, put your dog in a crate with a towel placed over it. Last year, someone let off a large firecracker near my home. The big flash of light before the loud boom freaked Bodhi out. Up until he saw the light, he was doing okay dealing with the noise. Anxiety Vests, also known as Thunder Shirts work to calm down your dog or cat's anxiety without the use of drugs. They work by applying gentle, constant pressure to a dog's or cat's torso which provides comfort. Click Here for more info about using Anxiety Vests. Playing music from Through a Dog's Ear and Through a Cat's Ear help desensitize and relax your pet. I played Through A Dog's Ear music for Kobe Bear. I now play it for Bodhi Bear every 4th of July and on New Year's Eve to minimize his stress. Click here for FREE SAMPLES, so you can choose what music is best for your animal family. Relax Your Dog YouTube Channel plays calming music for your pets as well. In general, uncomplicated classical music like Mozart and Beethoven are good choices to play for your animal family as it's soothing for both animal and human. Hemp CBD oil or treats help to calm pets and relieve anxiety. Never give THC products to your pets and only use products made from hemp, which has no psychoactive properties. It's always best to check with your veterinarian before using. Click here for more info on Hemp CBD products for pets. Tip #8: Distract and redirect your pet's focus by using chew toys, playing games and offering them treats as a reward for ignoring the booming explosions, if you can. Don't be surprised if your food motived hound refuses treats when fireworks are happening. Many times, when pets are stressed or scared, they refuse food or treats. Chewing reduces a dog's stress. Give your dog something fun and safe to chew on like a frozen Kong filled with deliciousness like chicken or peanut butter to keep them occupied. Playing with cats reduces their stress so grab your cat's favorite toy and have fun playing with them. Tip #9: Talk to your Veterinarian before the start of the holiday week. If you've tried the above suggestions and your pet still suffers anxiety during fireworks, it may be time to discuss medication options to ease their fears and tension. The 4th of July and New Year's Holidays are the two times of year that I strongly suggest medicating your pet if they tend to melt down. Your Vet should be one of your best resources to help your pet through this potentially nightmarish holiday week. Never give your pet any form of medication without consulting your veterinarian first given the potentially severe side-effects. While the use of drugs should be your last resort, it's a good option if your pet is like Kobe Bear. If you choose to medicate your pet, make sure you do give it to your pet sooner than later. Every 4th of July holiday, I receive numerous calls from clients whose pets are frantic from the noise and lights and some whose pets have gone missing animals. A large number of pets end up in the Veterinarian ER during the Independence Day holiday. During the 4th of July holiday; large influxes of pets go to the Vet ER for ingesting inappropriate picnic and BBQ foods such as hot dogs and fatty meats. Even ingesting a corn cob can make your dog very sick. Fatty BBQ meat can cause pancreatitis. It's better to avoid these types of foods to prevent gastric upset and a possible trip to the ER. If you are having a party, it's better for your animal family if they are kept away from the noise and potential danger of eating the wrong foods. Pets also visit the ER because they burn their paws on hot pavement or become dehydrate and overheated from the mid-Summer heat. Finally, you may want to set up a long distance Reiki session to support your pets with calm, grounding and nurturing energy. I'm available throughout the week if you need to talk with your pets about what's going on around them or offer them Reiki. The Animal Muse Family wishes you and your animal family have a safe and fun 4th of July Holiday!